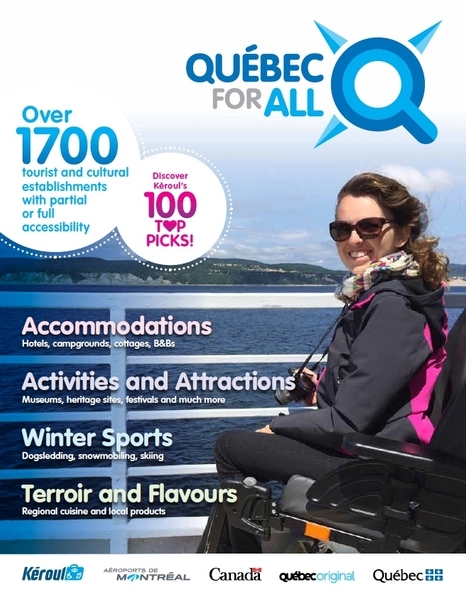 Québec for all is a database of over 1,700 tourism and cultural organizations and businesses assessed by Kéroul and certified fully or partially accessible, spread across 21 regions of Québec. This edition of Québec for all magazine will seduce you by giving you an overview of the diversity of Québec's tourism and cultural offer, in all seasons. This new edition is organized around three main axes: accommodation, attractions and winter sports. In addition, it has a strong place for gourmet and Aboriginal tourism, committed partners such as Sépaq, Aéroports de Montréal and economuseums, and a consulting component. She dares to commit herself by proposing the 100 "top picks" of Kéroul, drawn from more than 1700 tourist establishments with partial or complete accessibility.